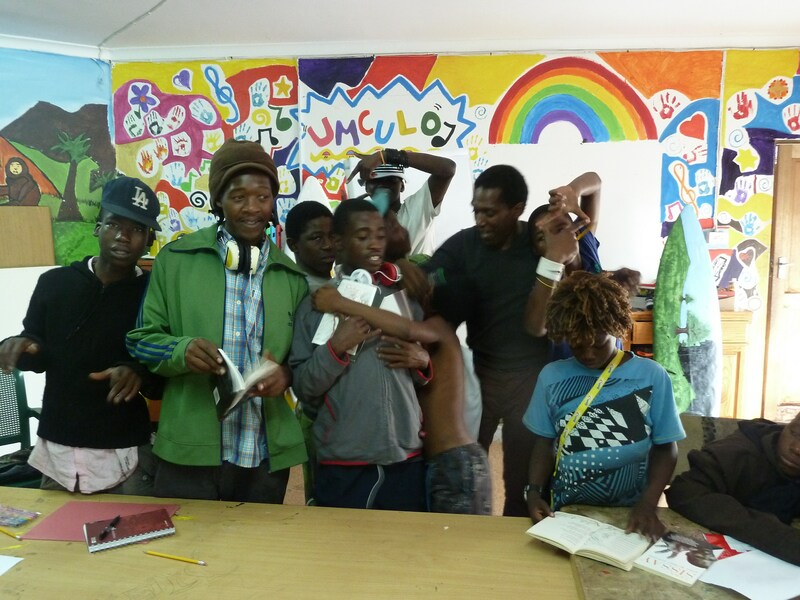 In Durban, the street children who live without family employ extraordinary skills to deal with extraordinary situations on a daily moment by moment basis. They consistently navigate crisis walking the thin line on the Long Road to who knows where. As they sit around the table in the recreation room one sleeps soundly with his head on the wooden top – dead to the world. It could, I was told, be withdrawal symptoms. There was beauty in his sleeping and in his being there, his dark skin, his closed eyes. “Tell me about the language of surfing” I said to the group cause I don’t know anything…. and as they saw the first line unfold onto the flip chart they caught my drift and a wave of children became themselves throwing out rhymes and constructing lines like children splashing water. The poem was written in a workshop lasting approximately ninety minutes. The afternoon was spent painting with Emma Wee of CAST who inspired by my poems as landmarks project – transferred their lines onto the walls in a beautiful beautiful way. Below is the poem. This is good solid and tanbgible development work all done in one day by CAST and Umthombo.